New technology seems to change the way that we conceptualize objects and seemingly without fail creates a schism between itself and the technology that it is “replacing.” This became a strong point of contention for the student who was to delve into this study. His intention was to create a direct relationship between digital fabrication equipment and traditional wood working techniques. Well versed in analog fabrication techniques, much of the study was to bring the students digital skills up to speed. This method of learning proved to be very fortuitous because much of the discussion on material behavior and properties could be bypassed. Emphasis could then be placed on detail and sculpting a more rigorous design process. The student concentrated on a single material in the realization for the finished pieces, uniform laminate birch plywood. This proved to be a material easily utilized on the CNC router and with an aesthetic different from much of traditional furniture currently produced at the school. The resulting design of the chairs feed heavily off of the sketches and body studies of Joe Columbo. The physical manifestation of these ideas are evident upon sitting. 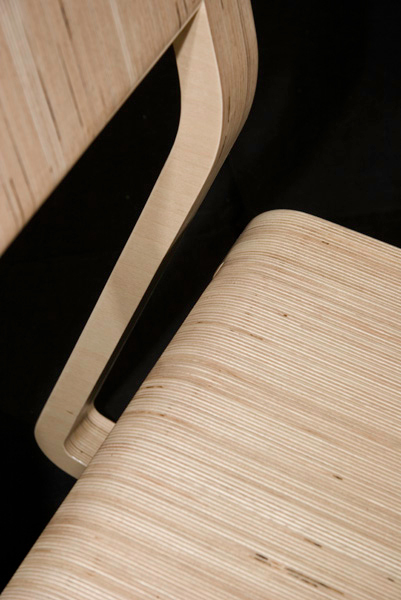 The thinness of the chairs allow the material to flex as you sink into them, receiving you. This softness is also reflected in the chairs ability to rock back into a stable position for after dinner enjoyment of wine. This study into the subtleties of object and the phenomenological qualities that occur with the things that surround us have proved to be a valuable experience for this student. The experience has permeated into his continued research with this design technique.